Our Political Map of the United States was such a big hit that we’ve decided to drill a little bit deeper by taking the same political map concept — sizing states by their population — to the county and city level. This week, the Crystal Ball examines the political geography of three presidential battlegrounds in 2012: Virginia, Ohio and North Carolina. Crystal Ball team members Geoffrey Skelley and Kyle Kondik, natives of Virginia and Ohio, respectively, and former Crystal Ball staffer Isaac Wood of North Carolina take a look at the key regions to watch in their native states. The idea of Virginia being a swing state is an entirely new concept, but it’s something the Commonwealth — and the nation — is going to have to get used to. The nature of the state’s population growth since the millennium has brought about major demographic and cultural shifts. Virginia is now the New Dominion, rather than the Old. Of the state’s 13% growth in population between 2000 and 2010, a large portion occurred in Northern Virginia, the diverse suburbs and exurbs of Washington, D.C. Examples of rapid growth abound: Prince William County grew 40% while Loudoun County led the state with a growth rate of 84%, making them the third and fifth-most populous entities* in the state, respectively. Fairfax County crossed the 1 million resident threshold, making it more than twice the size of the state’s largest city, Virginia Beach. NoVa, as it is somewhat derisively known among down-staters, is now the most powerful region in the state on Election Day. As shown on the chart below, Northern Virginia had more total two-party voters in the 2008 presidential election than any other region. But Northern Virginia is just one part of the story. 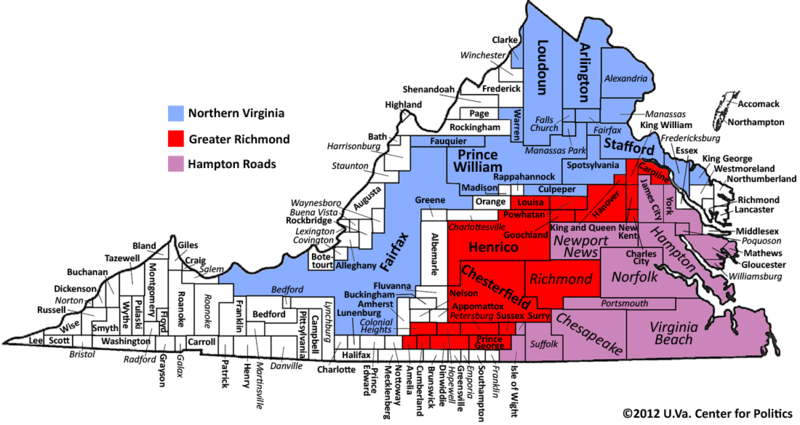 The other two important population centers are Greater Richmond, mainly composed of the state’s capital and the counties of Henrico and Chesterfield; and Hampton Roads, dominated by five of the seven biggest independent cities in the state: Virginia Beach, Norfolk, Chesapeake, Newport News and Hampton. Together, these three regions form what is known as the “Urban Crescent.” Making up more than two-thirds of the state’s population, the Urban Crescent holds the key to victory in the Commonwealth, particularly for Democrats. As Barack Obama showed in 2008, a candidate who wins all three can make the rest of the state’s vote irrelevant. More and more, Virginia looks and feels like a microcosm of the country as a whole in federal elections. While Democrats look to turn out their supporters in urban areas, Republicans look to run up the vote totals in rural regions. The two parties then battle for the suburbs and exurbs. On Election Day 2012, winning bellwether counties such as Loudoun, Prince William and Henrico — all won by Obama in 2008 — will be crucial to capturing the Commonwealth. *I use the term “entities” because Virginia has an unusual system of local government where its cities are entirely autonomous from the counties they lie within. The resulting “independent cities” have separate local governments from counties, although these cities may still serve as county seats. Almost all independent cities in the United States are in Virginia. NOTES: Click on the maps for larger versions. Regions are based on the metropolitan statistical areas (MSAs) defined by the U.S. Office of Management and Budget for Hampton Roads (Virginia Beach-Norfolk-Newport-News, VA-NC MSA), Greater Richmond and Northern Virginia (Washington Primary MSA). Standard font names are counties, italicized names are independent cities.